Salsa Rica Dance Company provides world class choreography, shows and productions in Alberta and around the world. Salsa Rica is known for producing top salsa dancers through their performance groups ranging from student level to their international touring company. 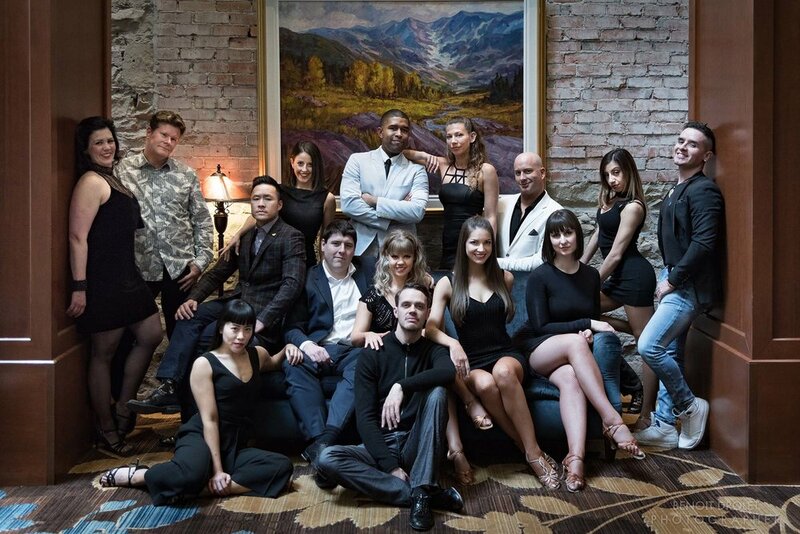 Directed by Eric Caty and Kelly Lannan, So You Think You Can Dance CANADA choreographers, Dancing with the Stars Calgary Tour dancers, and World Salsa Championship judges; the Salsa Rica Dance Company trains with the world’s best instructors, performs and teach at international Salsa festivals all over North America. Alberta Dancesport, Salsa Rica’s social branch, is Calgary’s best place to dance Salsa, and the Ballroom dances. Each week hundreds of dancers flock to the schools popular classes. If you are new to dance, this is the best place to get started. Salsa Rica Productions aims to elevate the status of Salsa and Ballroom dance in Canada through its classes and events, to make world class trainers and choreographers in the genre available to dancers in Canada, and to shine an international spotlight in Canada through their annual Calgary International Salsa Congress and Ballroom dance event The Rocky Mountain Dancesport Grand Prix. The dancers of Salsa Rica represent the vibrant and talented artistic community of Canada in a genre popular in many of the World's countries. Kelly Lannan has been a featured choreographer on So You Think You Can Dance CANADA and has danced on the local tour stop of Dancing With The Stars. She has been a finalist at many World Championship Salsa events; has represented Canada at 4 ESPN World Salsa Championships, 3 times at the World Latin Dance Cup, twice at the Mayan World Salsa Championships, and many international competitions. Kelly is a judge of many international Salsa events including the Global Salsa Championships at the World Salsa Summit, and trains many dancers from the student to professional level. Kelly is proud to be an owner of Alberta Dancesport, Salsa Rica Productions, the Calgary International Salsa Congress, and the Rocky Mountain Dancesport Grand Prix. She has been featured as Emcee at the Global Salsa Championships, Canadian Dancesport Championships, and many international Salsa and Dancesport events. Kelly is most proud to have the opportunity to represent her family, the dancers of Salsa Rica, and her hometown of Calgary. Shows are available in Salsa, Ballroom, Latin, and variety dance productions. We represent Calgary’s best dancers in many genres, and can produce a show for any theme. Salsa Rica specializes in teams from the student level to our internationally touring company. Contact us for audition information or if you are interested in adding a dance show, production, or class to any event. Salsa Rica's various teams perform at salsa congresses and special events all over the world. Catch them at some of these exciting upcoming events. Salsa Rica is very proud to be a part of this event! Eric and Kelly are proud to judge and help organize the competition for this prestigious event. For information and registration, contact us. Join us for Western Canada's Largest Ballroom dance event at the Hyatt Regency Calgary.